Come out with your .22 caliber or center fire handgun and try our Bowling Pin event, where shooters try to knock 5 Bowling Pin Tops off a table in 15 seconds or less. Open to members and non-members. Bowling Pin Events consist of shooting at bowling pins that are placed on a two tier table, with three pins on the bottom tier and two pins of the top. All pins must be shot off the table for the table to be considered “cleared” and to stop the clock. There is no maximum shot count and reloading is legal, but there is a time limit of 15-seconds for each table. Six tables are shot during the full course of fire. It takes about 60 shots in total to complete the course of fire. For .22LR handguns; the top 6” of the bowling pin is cut off and used. For center fire handguns; full pin bottoms (minus the top 6” of pin) are used. Any .22LR handgun or any center fire handgun (revolver or semi-auto) may be used. There is a ten cartridge cylinder or magazine capacity limit. Safety glasses and hearing protection is required for all shooters, timers and spectators. All sight types are acceptable. (i.e. iron, red dot, laser, etc.). At the command of the range officer, the shooters will be told to load their handgun. When all handguns are loaded and at the ready position (muzzle resting on shooting bench), the range officer will blow a whistle. This will start the timers and the shooters will commence shooting at the pins. When the last pin is shot off the table, the timer is stopped. Each shooter will be asked to unload their handgun and make it safe, unloaded, slide open and pointing down range. After the range officer has verified that the line is safe, the timers will be prompted to go forward and reset the pins. During pin resetting, the shooter is NOT allowed to go to the shooting line OR touch their hand gun. Magazines may be reloaded at the reloading table behind the firing line. When those persons resetting pins are safely behind the firing line, the process is repeated. Six tables are shot over the full course of fire. The shooting line is 25 feet from the pins. 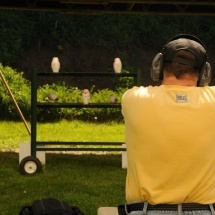 Once each shooter has completed their course of fire, they will be asked to perform the timing or pin setter role for the next line of shooters. Exception will be made on a case by case basis for various reasons. There will be a total of 6 tables shot. For each table the amount of time taken to clear it will be used as your score. If a table is not cleared, the maximum time of 15 seconds will be applied for that table. The best 5 table scores (times) will be added together and use for the total score. If more than one course of fire is shot (6 tables each course of fire), the best course of fire score will be used in the final scoring. If there is a tie in the total time, the discarded table will be used as a tie breaker. Four competition classes: .22LR iron sight, .22LR optics, CF Carry Gun (iron sight with one load requirement), and CF Other (any sight and no reload requirement). The final results will be calculated and a Lewis payback system will be applied. The winners will be announced within an email message sent the Monday following the event. An email message is sent to each of the participants. Registration is 9:00 a.m. to 1:00 p.m. Shooting time is 9:30 a.m. and until the last shooter shoots or about 3:00 p.m.
For information contact Paul Baird (734) 422-4080 or Bill Shope (248) 930-7225. 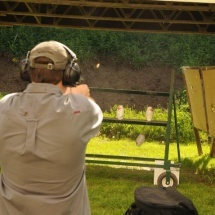 Shooters try to knock down six steel plates from various distances as quickly as they can. Open to members and non-members. For .22LR rim handguns; 6” diameter steel plates are used and for Center fire handguns; 8” diameter steel plates are used. At the command of the range officer, the shooters will to told to load their handgun. When all handguns are loaded and at the ready position (muzzle down), the range officer will blow a whistle. This will start the timers and the shooters will commence shooting at the steel plates. The timer will stop after the sixth shot is fired. At this time, magazines are reloaded, number of hits & shooting time is recorded, and the plates are reset. Once everyone is ready to shoot again, the process is repeated for a second time. Shooters will repeat this two string process for each of the four stages. Each stage will be shot at one of four distances, starting at the 10 yard shooting line, then moving to the 15, 20 and finishing at the 25 yard line. 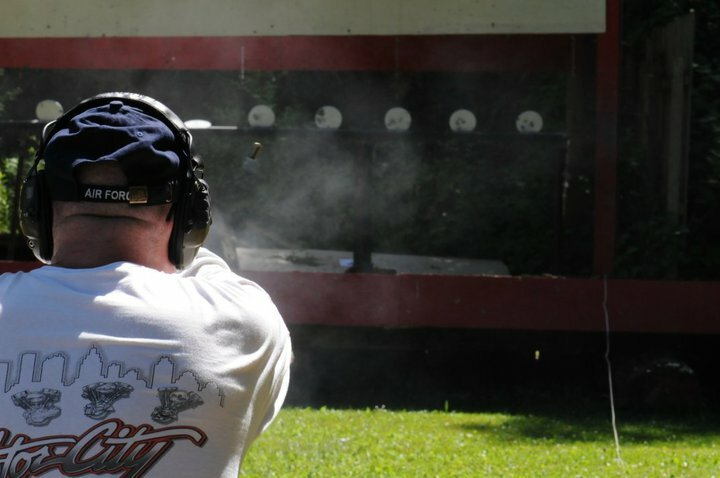 Once each shooter has completed their course of fire, they will be asked to perform the timing and plate resetting role for the next line of shooters. Plates knocked over are counted and the time to complete each string is recorded. All 8 scores (one for each string shot) will be tallied. Plates knocked over and the total time is factors towards everyone’s final score. Four competition classes: 22LR iron sight, .22LR optics, CF iron sight, and CF optic sight. Registration is 9:30 a.m. to 1:00 p.m. Shooting time 9:30 a.m. and until the last shooter shoots or about 3:00 p.m.